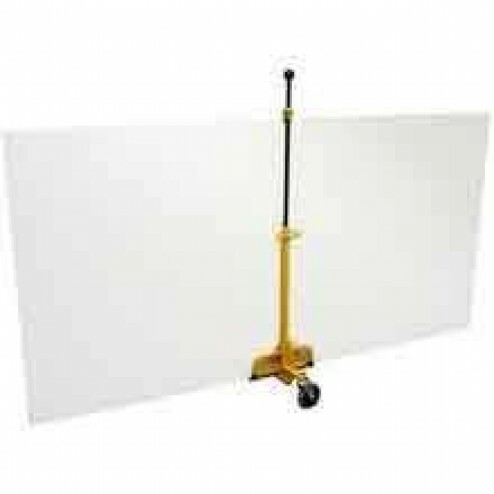 Haul wall boards drywall and more with this 4-1/2" panel handler featuring a load capacity of up to 250 lbs. and a swivel caster for easy loading. Telpro The Troll 112 Panel Handler is a back-saving panel handler that can easily be loaded and moved by one person. Perfect for hauling drywall, wall boards, tables, doors, mirrors, pictures and more. Equipped with a stationary caster and handle. Also equipped with a swiveling caster for easy loading. Slide clamp will handle loads from 28-1/2" to 51". Durable handle allows users to lift the handler up and over large objects. Hauls 4 wall boards up to 1/2" thick. Maneuvered easily in tight quarters due to an omni-dimensional design. Easily loads and unloads with a tilting motion.